We're Celebrating 27 Years of Business Success in 2015! The Business Writing Institute’s parent company, Nancy Flynn Public Relations, Inc., celebrates its 27th anniversary on July 1, 2015. Thank you to all of our clients, partners, publishers, associates, media outlets, and business friends worldwide who have helped us reach this significant business milestone. Check back for details about the Business Writing Institute/SyN Learning Institute Certification Program, a comprehensive webinar series offering continuing education credit for HR professionals. Courses include a five-part series from Business Writing Institute & a five-part series from our sister company The ePolicy Institute. Certification courses designed to meet the compliance & communication training needs of HR professionals. SHRM Preferred Provider & HRCI Approved. Our 2015 - 2016 training calendar is filling up with seminars, webinars, coaching programs & keynote speeches. Contact Nancy Flynn today to discuss your program needs and the professional services we offer through our Business Writing Institute & ePolicy Institute training divisions. Webinar: Monitoring Bank Employees' Work-Related & Personal Social Media: Should We? How? Is It Legal? Webinar: Monitoring Credit Union Employees' Work-Related & Personal Social Media: Should We? How? Is It Legal? 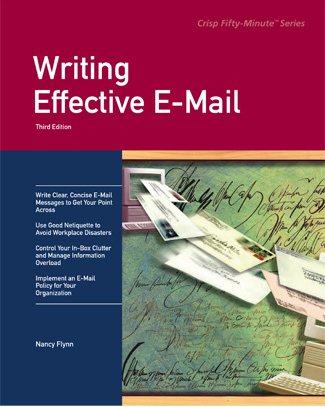 Revised in July 2014, Nancy Flynn's Writing Effective E-Mail, 3rd Edition, has been completely updated with new content & exercises. Bonus: Sample email, mobile device, and writing style policies that you can implement immediately. First published in 1998 and revised in 2003, Writing Effective E-Mail is an international best seller published in English, Chinese, German, and Spanish. Nancy Flynn, founder of the world-renown ePolicy Institute and author of Writing Effective E-Mail is recognized worldwide as the leading expert on effective & compliant electronic writing. This book teaches you how to write effective email messages, social media posts, and other online content-without triggering a lawsuit, regulatory audit, termination, or PR nightmare. Learn how to write email without getting fired, sued, or humiliated. Our sister company, The ePolicy Institute, is the world's first and foremost electronic policy training and consulting firm. Since 1998, the ePolicy Institute has been helping employers maximize compliance, manage behavior, and minimize risks (including litigation and regulatory investigations) through best practices-based policies and employee training programs. Founder Nancy Flynn, author of The e-Policy Handbook, The Social Media Handbook, The ePolicy Toolkit, Writing Effective E-Mail, and other books, is internationally recognized as the leading authority on workplace email, social media, mobile device, and Internet policy, compliance, and communications. When lawyers, compliance officers, records managers, HR pros, IT directors, employers, meeting planners, and the media need experienced advice and services, they turn to Nancy Flynn, the ePolicy expert. The ePolicy Institute provides training, speaking, expert witness, and policy writing services to clients worldwide. We help keep you in business and out of court. Visit the ePolicy Institute to learn more about our training programs and other services.